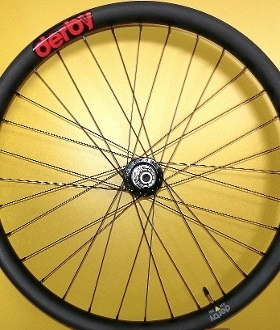 27.5 x 35i wide AM Derby Rims, angled spoke holes and water-drain holes. White Industry XMR+ Black anodized hubs, 6-bolt rotor mount. 15 x 110mm (boost) front axle. Rear 148 x 12mm (boost) rear axle. SRAM XD free hub. Fast 48-click engagement.